BEFORE: Today marks my seventh movie in seven days, the first milestone in what will hopefully be a long-lasting experiment. One week completed; 51 weeks to go. One realization I’ve made this week is why I probably never got around to watching any of these films; it’s just so hard for me to pick one film. I can’t blame it on lack of choices. In fact, my list has ballooned from the initial 636 films to a current total of 691 films and that’s counting the seven I’ve already watched. No, I think the reason it’s so hard is there are too many choices. I can’t possibly pick just one film. As a result, I need to come up with a rationalization for the film I pick. 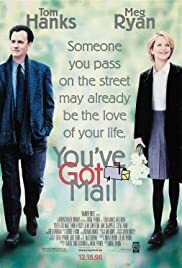 That’s basically just a long way to say my film for today is You’ve Got Mail. The reason is because it connects back to the first film, Sleepless in Seattle, with Nora Ephron at the helm and another pairing of Tom Hanks and Meg Ryan. AFTER: I don’t know what it is, but Tom Hanks and Meg Ryan just work well together. They don’t even have to be in the same place as each other; any form of interaction will do. And that’s saying something since a lot of this film relies on their email exchanges over a dial-up internet connection. Even though they’re not in the same room, it’s like they are. Hanks and Ryan really have the talk-to-yourself-while-writing expressions down pat. Then you have the scenes where they are together and it’s a whole new level. My favorite scene in the whole movie by far has to be when Joe Fox (Hanks) and Kathleen Kelly (Ryan) start seeing each other everywhere they go in New York and do anything they can to avoid making eye contact. Even though there are many things that are quite dated (dial-up, AOL, typewriters) there are also many contemporary things as well (Starbucks, the battle between megastores and mom-and-pop shops, the idea of online relationships). It was a great movie that left me wondering, “When can we get another pairing of the wonderful Tom Hanks and Meg Ryan?